I'm making some progress with my pink/purple lake. I have completed one version of it that has some good aspects to it. I'm particularly happy with how I handled the dark reflection of the trees in the water. I mixed a good dollop of sepia paint in with the dark water wash I had used for the bottom part of the picture. 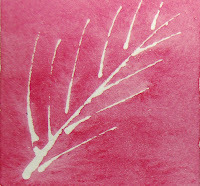 I then used a stick to draw the paint across, creating a fuzzy effect, which I think works well. The colours I chose work together, and I managed to blend them with enough subtlety to give a good impression of the pink clouds reflecting in the water. But the darker water in the bottom right of the picture gave me some trouble: as I was working wet-into-wet, there was a lot of water on the paper, and some of it ran back from the bottom of the paper, producing heavy backruns. Not good enough to show here, but there is enough that I'm happy with to have another go! The pictures here are cut-outs from this first attempt, with the bits I like and the bits that are not so good. So, I've started a second attempt at it. My first wash was the best wash I've ever done, thanks to a lovely big squirrel brush I bought in the Utrecht art shop in New York (heaven for art supplies lovers like me!). It holds so much paint that it glides over the paper and there is still plenty of paint in the brush by the time you get to the end of the line. It has a distinctive smell. I'm not sure if that's how squirrels smell, but it reminds me of the smell of old fur coats in my Mother's wardrobe! I think it's going to become one of my favourite brushes! Don't forget to click on the pictures to see them in a larger format. They look better on screen than the overall picture looks in reality, but, hey, that's the beauty of online art! When we went to Connemara a few weeks ago, we went into Roundstone for lunch one day. Our experience last summer had been pretty awful. We had had a bowl of seafood chowder in a hotel on the main street, and it was vile - a watery, milky soup with thin burnt brown bread. And the waiter just didn't know what to do when we complained. He actually offered to give us another slice of the burnt bread! It was such a disappointment - we just could not find a decent place to eat at lunchtime anywhere in Connemara - food was of poor quality, and expensive, where-ever we went. We felt really ripped off. That no place could be bothered to make decent, simple, good-value food for tourists was such a disappointment. And such a reflection on the rip-off culture in Ireland! It restored our faith in the Irish tourism industry. 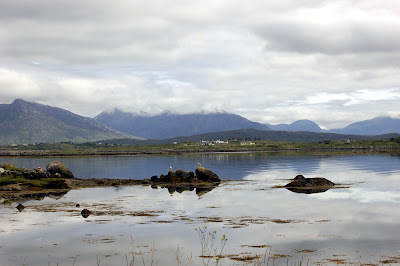 Pictures are winter and summer views across the bay from Roundstone towards the Twelve Bens. This week, I was finally feeling better and started going to the gym again, and went to my yoga class on Tuesday evening. I took it easy, but I felt much better after it. The class is taught by Patricia Murphy in Airfield. I've been going to her classes for years, and I only ever miss a class if I'm really sick. She is a great teacher - she always seems to be able to bring a new angle to each class to keep us motivated and interested. No esoteric or mystic talks - but a good overall yoga practise. She's into other aspects of health and fitness, and she is always sharing her other experiences with the class - she's got big into running in the last couple of years, and she often has great stories to tell us. It's not just a physical practise, though: she introduces all elements of yoga, including relaxation, meditation and chakras, but she doesn't push anything that she feels would alienate those in the class who only want a good stretch. She is full of energy and really down to earth, and I always feel good after the class. Have a look at her blog if you want to find out more. I'm currently agonising about my next watercolour. I want to do a view of the still water on the lake at the back of Ballynahinch Castle Hotel, from a picture we took last summer. 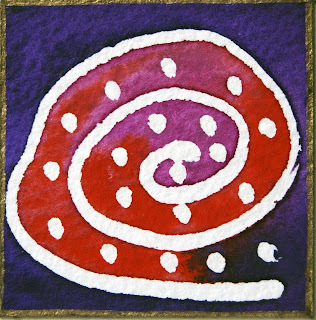 It's all delicate colours subtly blending into each other, with very little movement. I still don't know how I'm going to do this, so I'm finding any possible excuse to delay the moment when I put paintbrush to paper. One of the books Brendan gave me for Christmas is "taking risks with watercolour" by Shirley Trevena. 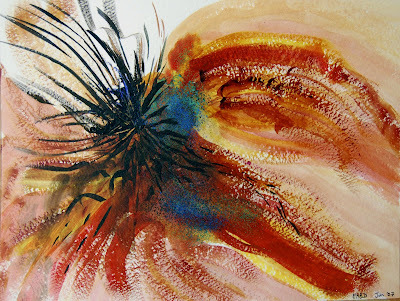 Her watercolours are nothing like what you'd expect watercolours to be - they are a vibrant riot of colours blending and merging together with little regard for the standard "rules". One of the pieces of advice she gives to fight off the fear of the white page is to do an abstract painting, using all the colours you plan to use for your "proper" painting, and letting loose on the page. A great excuse for me to splatter paint all over the page, and a great way to enjoy putting colours together, without fear of getting it wrong! I'm still not 100% recovered from my throat and chest infection, so I'm taking it easy. I've worked through the week, but at a slower pace. Around 4 yesterday, I just had to put my feet up and take it easy for the evening - I was feeling very low on energy. After a good night's sleep (no coughing - a minor miracle! 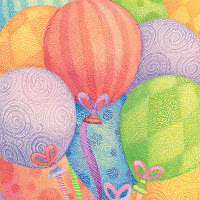 ), I feel pretty good, but I won't be up to much today. Just getting laundry organised has got me feeling like I need a little rest. The weather outside has just turned from bright blue skies to dark clouds, high winds and heavy rain. The perfect reason to stay in, pick up my book and relax for the rest of the day. The picture below looks more like the Wild West than Connemara. I love the dark blue in the shadow of the mountain. Busy busy run run, so not much time to write today. I prepared a few pictures yesterday, so I can present them on days I don't have time to write. 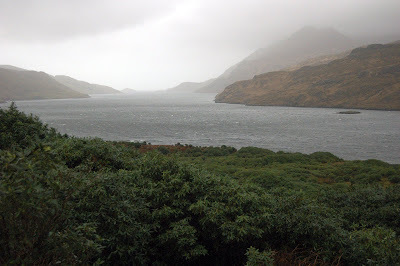 This one is a view looking out from Killary Fjord. We were standing more or less across the road from the Killary Adventure Centre. A beautiful spot, right bang in the middle of nowhere. Compare this picture to the one taken from the same spot last summer: Click on this link. 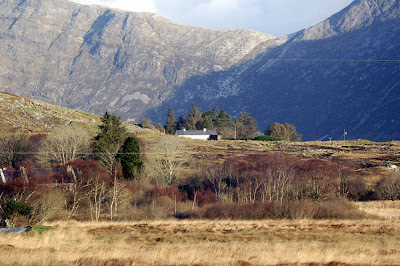 Here is a picture taken last week on the main road that goes from Galway to Clifden. This is around Recess, as far as I remember. 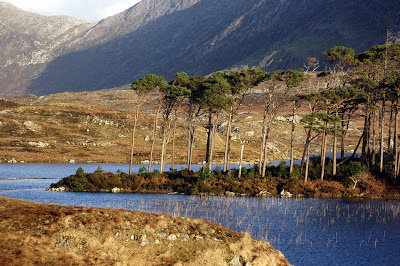 It's probably one of the most photographed spots in Connemara - Big mountains, blue lake, small island with photogenic trees, and also telegraph poles and cables! I was serious about going to the gym, and about drawing and painting, but I haven't done anything in the last week. Of course, I have very good excuses for this, which I'm going to go through now. 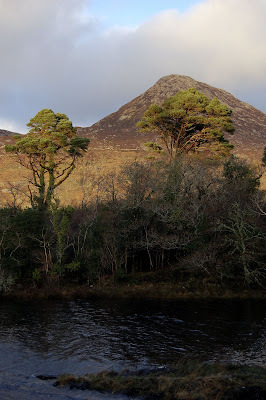 Last Sunday, we drove to Connemara (yes, I can hear the tune in my head ... "Terre brûlée au vent, Des landes de pierre..." - every time!) for a minibreak. We had decided that, after a busy family-oriented Christmas and New Year, we wanted a bit of time for ourselves. So we booked a 3-night stay in the Ballynahinch Castle Hotel in Recess. We had liked it so much in the summer, that we decided it was the perfect location for a winter minibreak. While the weather wasn't perfect - this is the West of Ireland in the winter after all - we had enough dry weather to enjoy a walk on the beach at Dogs Bay and Gurteen Bay, near Roundstone (pictures in a previous post). And of course, the weather was glorious on the day we were heading back to Dublin. We saw some dramatic scenery in various weather conditions - mountains emerging out of the clouds for a brief moment, before disappearing again, perfect blue skies that bring out the orange colour on the ground, purple mountains in the dying light, waves on the lakes. Scenery that's not as easy to photograph as perfect blue skies of summer, unfortunately, but we took plenty of pictures all the same. And of course the hotel was perfect. We had a river-view room. More modern than the room we had in the summer - Lovely bathroom, with a walk-through wardrobe and dressing area (with double doors leading through each - very Hollywood! ); Nice big bed; Good central heating. The food was excellent (the 3-night deal included 2 evening meals in their main Restaurant - well worth a visit). I had lobster one of the nights - I love food I can play with, and Brendan enjoys watching me wrestle with the claws. I had pan-fried scallops the other night. I can't remember what starters and soups were but all were good. Brendan enjoyed his lamb (cooked to perfection) and monkfish. And desserts, of course, were to die for - I had panacotta the first night (this is the only place I know that does panacotta - I'll have to go back to that recipe I found in the summer!). It was Baileys panacotta (but just a very subtle hint) with - wait for this - lavender coulis (well probably not a coulis - but Lavender! You would not have found this kind of food in Ireland 20 years ago!). Brendan had a simple but scrumptious flan one night and the special chocolate dessert on our last night, whereas I opted for a simpler, but nonetheless delicious, rice pudding with stewed plums. And I had pan-fried liver for my breakfasts. I love liver, but Brendan doesn't. As he is the designated cook and I never think of asking for it, I don't get to eat liver at home! So, I enjoyed it all the more. And we bumped into Alexis, who was there on her honeymoon. So I finally got to meet Pat, her husband. When I saw her first in the lounge, I just saw her in profile, and I wasn't sure it was her. But when we walked into the restaurant later that evening, I had to go over to their table and say hi (and thank God it was her). So, I've only accounted for 3 days. What was I doing for the rest of the time? Well, I was sick. That's not very exciting so I won't go into the boring details of sitting up in bed all night to try and stop the coughing fits (and failing). Throat and chest infection - I don't know why I always think I'll be able to fight it off without antibiotics. I always end up needing antibiotics. Just as well I don't get sick very often. I feel I have a lot of catching up to do. Plenty of things to paint and draw, and write about. PS: Pictures from Connemara to follow - I still need to sort through all the pictures we took. Sander a un an! Et il marche déjà! Pour voir les images de ses premiers pas, allez faire un tour sur le site d'Yves. Vous trouverez les photos sous la rubrique "A la maison". Le site contient toutes sortes d'articles sur l'enseignement, la physique, la chimie et l'informatique. Moi, il n'y a que les photos qui m'intéressent vraiment! Avec un jour de retard, je te souhaite un très bon anniversaire. J'espère que la carte arrivera bientôt et que tu ne devras pas payer de supplément pour la poste! I'm not making much progress in painting and drawing projects these days. I'm experimenting with plenty of new techniques from a watercolour book Brendan gave me for Christmas, but I'm not actually painting anything much. I get so absorbed in the techniques that I forget about creating something. I've done some nice splatters of blues and yellows and masking fluid, and I'm experimenting with different paint qualities - transparent & opaque, staining and non-staining - all things which will come in useful when I actually apply them to a painting, but I feel I'm not very inspired these days. I have a painting in mind, based on a picture of the still water on the lake behind Ballynahinch Castle - it's evening, and the water is perfectly calm; the low sun is reflected in the water, and the colours are subtle mauves and pale golds. 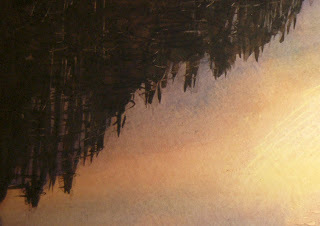 The problem I have is that I have no idea how to tackle that stillness in watercolour. I should just experiment. But it's so much easier to play with new techniques rather than actually taking the risk of trying to paint this! I've done a good few drawings over the last week. There wasn't much else to do in the few days after Christmas, and I've practiced my ellipses - very difficult to do, ellipses! I need a lot more practice! - and I've done plenty of little thumbnail sketches. Nothing worth posting, but good practice all the same. OK, I'm a few weeks behind in mentioning this, but things were just too busy around Christmas, and I didn't get a chance to blog as much as I wanted to. On 20 December, we celebrated our 10th wedding anniversary. Just like our wedding day, there were no big fanfares! Actually, the day was dominated by the drama of fog in Charleroi and cancelled Ryanair flights. But we made time for ourselves in the evening and went to Langkawi, a Malaysian restaurant on Baggot Street which has become our anniversary restaurant - we've made it a family tradition to go there on our wedding anniversary, and I wouldn't go anywhere else, even if you paid me. Over the years, the food quality has gone up and down, and prices have definitely gone up, but I still really like going there and discovering new dishes. I definitely made the better choice for starters, with tasty and tender meatballs, while Brendan's fried chicken was a bit too crisp. It was the reverse for main courses. I can't remember what Brendan had, but he enjoyed it. I had a beef dish - the sauce had a lot of flavour, but unfortunately, the meat was tough. One of the things I love in there is the art on the walls. They have some gorgeous big paintings, some with an Oriental theme, and others which look a bit out of place, but still somehow work: there is one of an Asian dancer - the light is captured beautifully on her face; there are also a couple of smaller square paintings of Chinese bowls - I would love to take those home - they look so simple, yet so perfect; there is one with a big dragon; and then there is one that looks like a Mediterranean wall and steps with geraniums. Langkawi is definitely worth a visit, if only for the visual joy of those paintings! A lot of birthdays in January! Mary - 1 January. Sorry I didn't get to call! The last few weeks have been pretty bad in terms of exercise. Not only have I not gone for too many walks, but I've hardly gone to the gym either. When the alarm goes off and it's still so dark outside, we have turned around and gone back to sleep instead! Well, this morning, we have tried a new strategy: rather than try to get up at 6:15 (and fail every morning! ), we set the alarm clock for 7, and we did manage to get up and go to the gym. It was lovely and quiet up there - it's an in-between time - and we enjoyed a light session to get back into the swing of things. The gym we go to is Total Fitness Sandyford. It takes less than 10 minutes to get there - a big motivator for us. It's got good facilities overall, though I have to say that the changing rooms are not as clean as they used to be. They used to have an Eastern European girl cleaning there in the morning, and she was very efficient and thorough. Things have gone down since she has left. I have complained to the manager, but I can't say I've seen much of an improvement since I talked to him. But overall, it's not bad, and I feel it really makes a difference for me. Who would have thought that I would become a gym goer?? If you had asked me a year ago, I would have said NO WAY!! I'm not fanatical about it - I like a gentle routine rather than a vigorous workout - but I try to get there 4 times a week. Our average in December probably got down to once or twice a week, so we have a bit of catching up to do! So, that's my good resolution for the New Year! After a family-oriented Christmas, we're back working today. Plenty to catch up on, plenty of broken computers that need fixing, so we've had a busy day. I'm sure the days are getting longer already, but it's still so dark! I can't wait for the days to get longer. I normally love this time of the year, as I watch for the faintest glimmer of light in the sky! But I was in the house pretty much all day today, so I didn't really get a chance to feel the fresh breeze on my face and to see the sky, beyond the bit I can see out the window. Tomorrow is another day, and I'll try to get out more, and get a walk in. I feel I really need to get more oxygen into my lungs. Normally, we'd go for a walk every day over the Christmas period, and get plenty of fresh air. This year, we only went for a brief walk in Bray, and a stroll over in Marlay Park. And a 10-minute walk on the waterfront in Blackrock, Co. Louth, and one walk around Black Island in Castleblayney. So, my body is screaming for fresh air! A piece of trivia: It is in the baths in Blackrock, Co. Louth, that Brendan learned how to swim! And a rant: The baths are no longer there now. They have been replaced by an awful apartment block, so typical of the ugly architecture in small towns all around Ireland - completely out of context with its environment. The worst town I've seen in recent years in that regard is Clifden in Connemara. Clifden used to be a picturesque town. Not any more! A multi-story car park and apartment block was built on the edge of the town. It dominates the landscape and has ruined the view from one side of town. And there are plenty more apartment blocks going up. How did the local councillors give planning permission for such eyesores? And in case the first picture did not reveal the horror in all its gory details, here is a close-up!